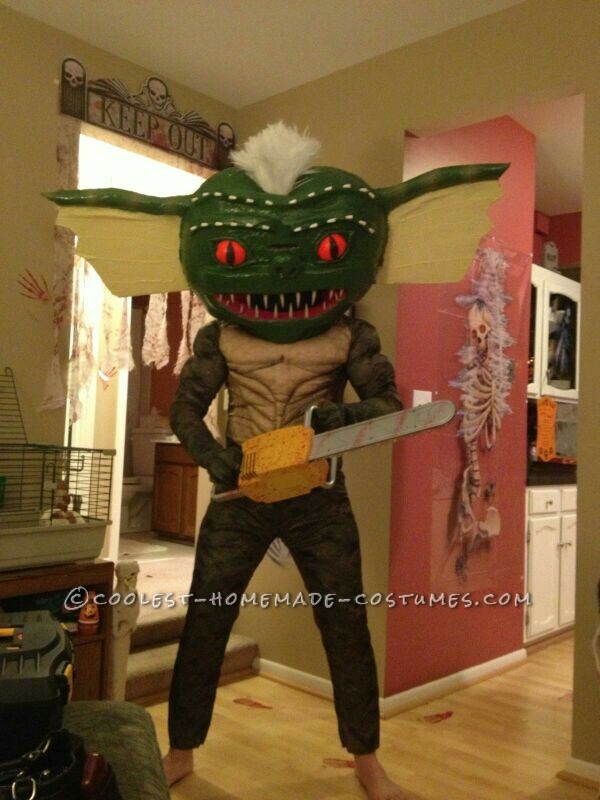 Transforming Homemade Gremlins Costume: Don't Feed Gizmo After Midnight! 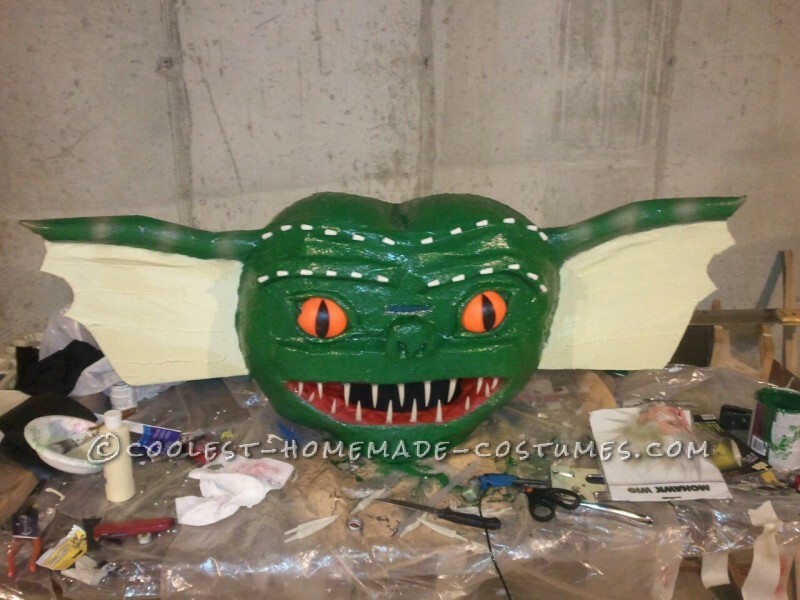 Transforming Homemade Gremlins Costume: Don’t Feed Gizmo After Midnight! One of my favorite movies as a kid was the movie Gremlins! The movie is based on a pet named Gizmo and the chaos that surrounds him once certain rules are broken. The two main rules are “Don’t feed Gizmo after Midnight” and “Don’t get Gizmo wet”! After these rules are broken a new type of Gizmo is created called a Gremlin! Over all I would say the costume took about 2 months to complete working on it in my free time. 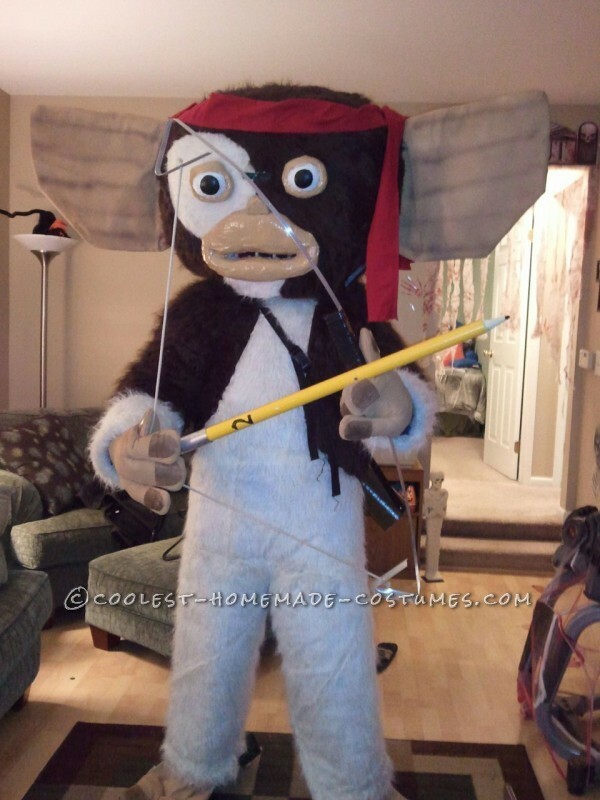 Here is my 2012 Coolest Halloween Costume…..Gizmo turns into a Gremlin!! My favorite part of the costume is seeing the shock in people’s faces as Gizmo transforms into the Gremlin! Check out the video and let me know what you think and if you have any questions!! I took a flight zip up suit and cut it down the middle of the back. I cut the suit down the middle so I could break out during transformation. 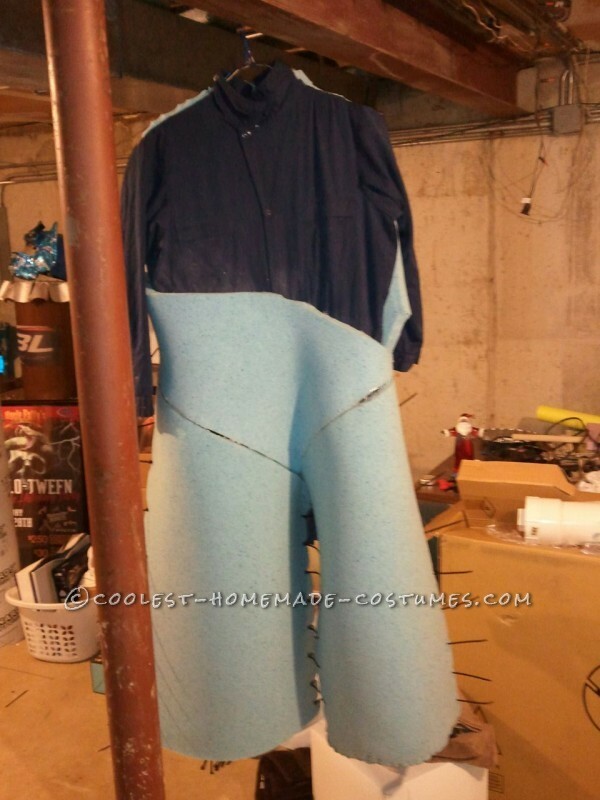 Using 1″ memory foam bought from Ebay I cut and covered the whole suit in the foam. 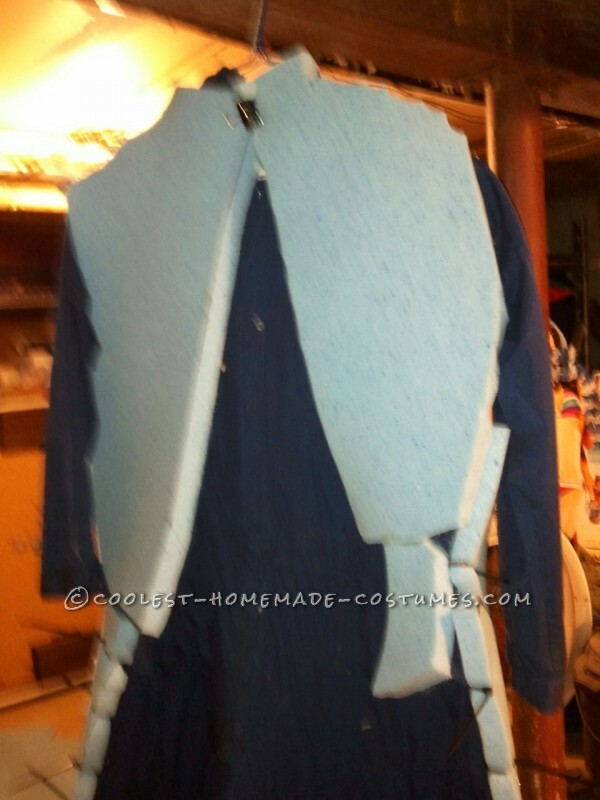 The foam was glued to the suit with the use of hot glue. Some of the main heavier parts were secured using electrical ties as pictured. Once the entire flight suit was covered in foam the next step was to sew on the fur. Since I had to sew through a flight suite, foam, and fur I decided to use a 15lb fishing line so it would be more durable and not break. This was the most time consuming part of the costume. The brown and white fur was bought from a fabric store. Velcro was sewn on to all the edges so that the suite would close down the back. Since there was no easy way to sew a lizard costume I bought an adult Lizard costume from the store. 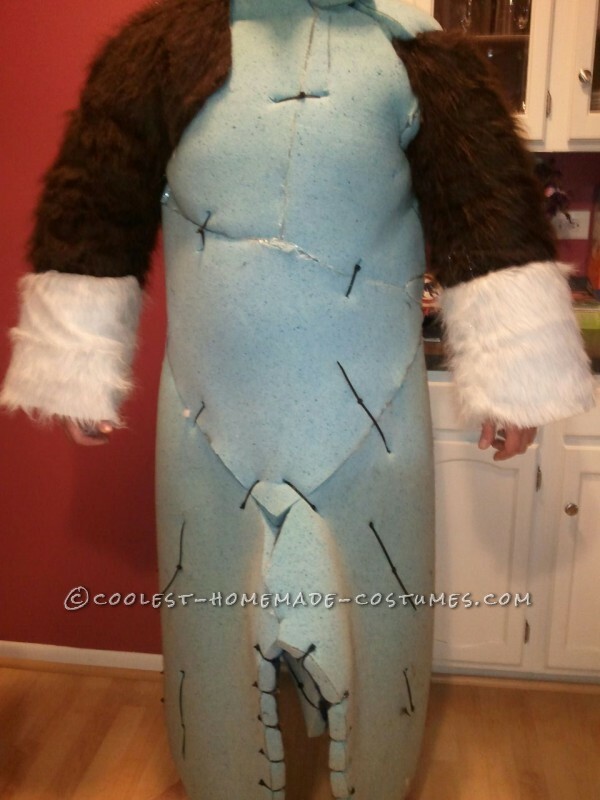 The costume needed to be made of spandex so it could be easily concealed under the Gizmo fur costume. Now that the body is done the next step is the head. I started with a cement tube for the base of the head. 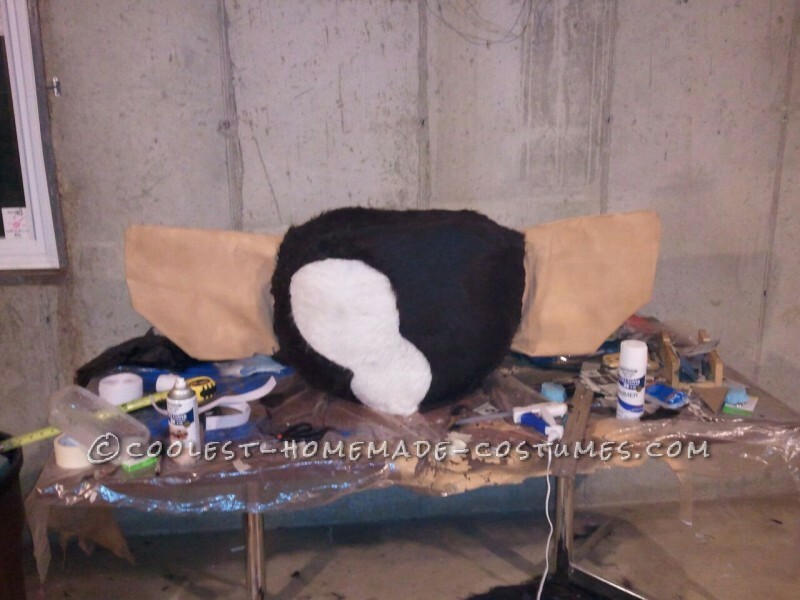 Then using masking tape, newspaper, and cardboard I created the outline of the Gremlins head. 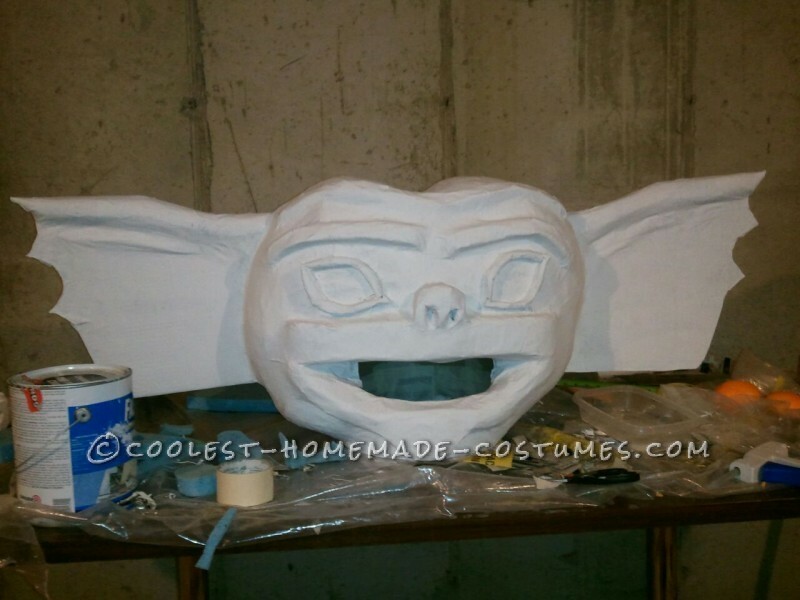 After 6 layers of paper mache the details of the Gremlins face were added and covered in primer paint. Once the Gremlin head was done I needed to make the Gizmo face that would tear away to reveal the Gremlin. I covered the Gremlin in Tin Foil first and then added 3 layers of paper mache. Just enough to make it flexible well at the same time keeping the shape I needed. Once dry I hot glued on the fake fur letting some areas overlap. I cut along the bottoms of each ear and across the top of Gizmos head so that the face could release into two pieces. I used Velcro to hold the face back together after cut. The eyes of Gizmo were again a fake orange cut in half and spray painted white. The mouth and nose was paper mache. 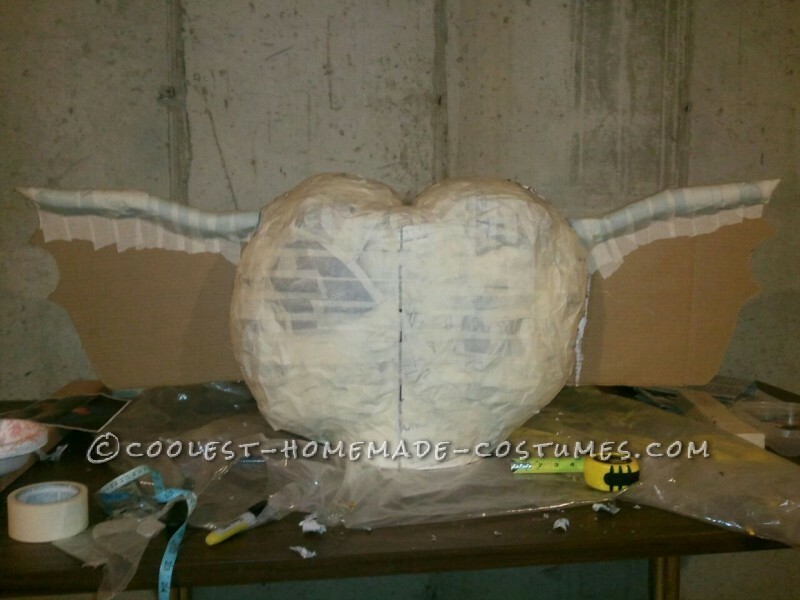 The ears were plain white fabric spray painted to match Gizmo’s mouth and nose. The ears were slightly bigger than the Gremlins ears so they could slide off when needed. The hands of Gizmo are clown hands. Gizmos bow was made out of a flooring strip divider and rope. 1 x 1 was used for the handle. The pencil arrows are made from PVC piping, fence topper, and a rubber stopper. The chainsaw the Gremlin uses is store bought. Homemade costume idea posted by Sean A.
Oh wow! that is awesome!! If i only had the skills to come up with something like this. It’s awesome!